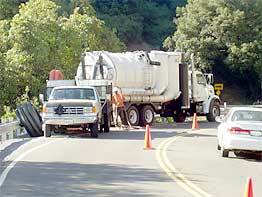 24/7 emergency spill cleanup response operations. Transportation equipment consisting of vacuum trucks, roll-off bins, flatbeds with liftgates, end dumps, and transfer trucks. Storm drain sample collection and certified laboratory analysis. Hazardous waste packaging into appropriate DOT-approved containers. Lab packing of small quantities of hazardous waste consisting of petroleum hydrocarbons, solvents, alcohols, heavy metals, acids, bases/caustics, oxidizers, water reactives, dangerous when wet compounds, pesticides, PCB's, flammable liquids & solids, low level radioactive wastes, compressed gases, and some explosives. Federal DOT and State of California licensed interstate transporter of containers and bulk quantities of liquid and solid hazardous and non-hazardous wastes. Empty container disposal for metal, poly, & fiber, drums, totes & boxes. Excavation of non-hazardous or hazardous contaminated soils for transport to appropriate Class II or III landfill or TSDF for disposal, treatment, or incineration. Soil, vapor extraction & thermal oxidizer system for groundwater contaminated with petroleum hydrocarbons, solvents, chlorinated hydrocarbons, other volatile organic carbon compounds (VOC's), and certain pesticides. Air sparging of groundwater contaminated with petroleum hydrocarbons, solvents, chlorinated hydrocarbons, other VOC's, and certain pesticides. Activated carbon absorption treatment of groundwater and air emissions from organic vapor and gas sources from leaking UST cleanup sites. Treatability studies and full-scale bioremediation of petroleum hydrocarbons contaminated soil and groundwater contaminated sites. Underground Storage Tank (UST) and Aboveground Storage Tank (AST) tank cleaning that include certified personnel performing confined space entry. Specialized equipment for tank cleaning operations including vacuum trucks, pneumatic pumps, personnel retrieval systems, supplied air systems, spin jet cleaning systems, high pressure & hot water cleaning systems, etc. Vacuum truck services includes stainless steel 70-120 BBL tankers for pumping and transporting various hazardous or non-hazardous wastes. ACE Guzzler Vacuum truck for pumping liquids, solids, sludges and sand or aggregates less than four inches in diameter. This truck can separate and dump or discharge liquids from solids out of its storage tank. Flatbed trucks for transporting drums, small containers, poly or steel totes, and tri-wall fiber boxes. Roll-off boxes or bins for contaminated soil, transite pipe, debris, and other solid waste for disposal as hazardous or non-hazardous waste. Provide open or closed top 20 and 40 cubic yard size bins. Delivery and pickup of heavy construction equipment and industrial equipment. Transport clean soil, aggregate, sand, and asphaltic concrete to job sites. Clean storm drain systems consisting of sumps, drain interceptors (DI's), stormceptors, storm drain vaults with filters, storm screens, & storm drain lines using vacuum trucks, ACE Guzzler truck, Jetter systems, and pressure wash systems. Provide Street Sweepers for cleaning parking lots and large paved areas that have absorbent or sand placed down for cleaning up petroleum hydrocarbon spills. Street Sweepers are also used for cleaning paved roads exiting remediation sites that use end dumps and transfer trucks to transport contaminated soil to disposal facilities. 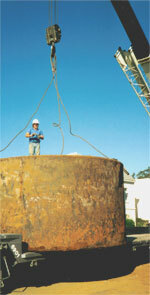 Maintain and repair various types and manufacturers of storm drain systems. Decontaminate and demolish tank farms, structures, oil/water separators, concrete sumps, pipelines, retaining walls, etc. Cutting and scrapping cleaned ASTs. Steam, hot and cold water pressure wash cleaning USTs & ASTs, portable tanks, containment areas, vacuum trucks, structures, parking lots, and other paved areas. Jetting services for storm drain and sewer systems. Collection of rinseate from cleaning operations using vacuum trucks. Profile, manifest, transport, and disposal of hazardous or non-hazardous wastewater. Phase I, II, and III environmental site assessments and reports for real estate property transactions that are prepared & signed by a Professional Engineer or Geologist. Investigation of Leaking Underground Fuel Storage Tank (LUFT) sites which includes installation of monitor, extraction, injection, and recovery wells. Collect soil and groundwater samples for certified laboratory analysis. Design treatment systems for LUFT sites. Provide reports and closure of LUFT sites and other spill cleanup properties. Perform plant facility Environmental Audits. Perform Mold Surveys and Reports. Prepare remedial work plans for cleanups of clandestine drug labs. Perform drug lab cleanups that include decontamination or demolition of surface areas inside the dwelling. Removal of contaminated articles, fixtures, debris, and construction materials. Site clearance for reoccupancy of building, room, or dwelling after completing cleanup operation. Assessment and abatement of mold on interior and exterior of buildings, structures, or other dwelling areas. Post Mold Abatement Site Clearance for reoccupancy. Install erosion control BMPs such as blankets, fiber rolls, silt fences, etc. Earthwork, slope repair, grading, & bioswale installation. Treatment systems for vapor extraction, air sparging, and activated carbon treatment systems for contaminated groundwater sites. Installation, maintenance, and repair of storm water drain systems. Hazardous material/waste storage and containment structures. Hazardous, non-hazardous, and industrial wastewater treatment systems including providing regulatory permit compliance.